She should not even be called a mom. Mom’s don’t drop their newborn babies from a high-rise because they are scared to tell their parents. With all of the available birth control options, there is no reason to have an unwanted pregnancy in a relationship. And involuntary manslaughter?? She dropped her newborn eight stories from her bedroom window… What did she think was going to happen? 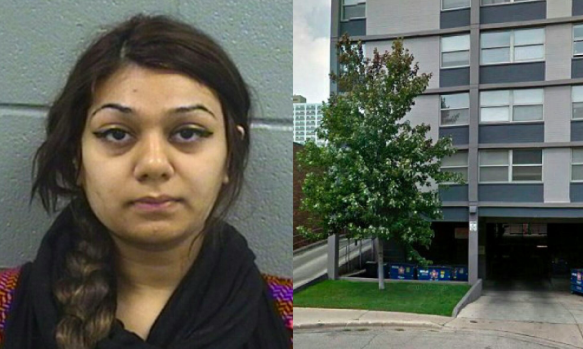 Twenty-year-old Mubashra Uddin was charged in 2015 with first-degree murder for allegedly dropping her newborn infant out of a high-rise apartment building. Speaking to police, relatives of the girl say that her strict Muslim upbringing led to the series of events that eventually led to the tragedy. This week, Uddin was sentenced to probation. Uddin was even prohibited from speaking to boys. Relatives say that when she turned 13 and found a boyfriend at school, her strict Pakistani-born parents pulled her out of high school and homeschooled. It didn’t really help. When she went to DeVry University, Uddin found out she was pregnant and told only her boyfriend and one other friend, according to the Chicago Tribune. She concealed her pregnancy from her strict parents, and when she finally gave birth in their home, she allegedly held the newborn infant outside of her bedroom window and dropped it eight stories, where it suffered a fractured spine and skull, broken ribs, and many other injuries — eventually causing death. The infant survived long enough for rescuers to wrap it in a blanket, but was pronounced dead at a nearby hospital an hour later. Police say that she initially denied having anything to do with the baby, but made “multiple admissions” on video following police interviews. Though she was originally charged with murder, Uddin was sentenced to four years’ probation after she pleaded guilty to involuntary manslaughter of her infant this week.